Welcome to BALLET SCHOOL, the series that follows the fortunes of a group of working-class students at an inner-city dance academy! Join this diverse group of young dancers as they form friendships, consider their futures, and prepare for the end-of-year shows. Class is about to begin at Rosewood Ballet School! Join Willow and her fellow students as they overcome disaster, injuries, and last-minute nerves to put on a unique production of The Nutcracker in celebration of their friend Samira’s beautiful garden. 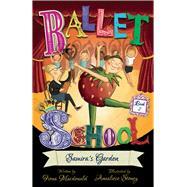 Contains illustrations of dance poses, a glossary of ballet steps, and a comic strip version of The Nutcracker. Fiona Macdonald studied history at Cambridge University and at the University of East Anglia in England. She has taught in adult education and in schools and universities, and is the author of numerous books for children on historical topics. Annaliese Stoney graduated from University College Falmouth’s illustration course and works as a freelance illustrator from her studio in Salisbury (Wiltshire). Annaliese’s first authored and illustrated picture book, It's Not Just a Blanket!, was published in 2014 by Bonney Press (an imprint of Hinkler).